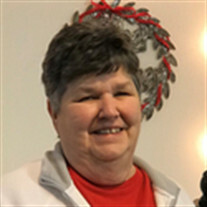 Obituary for Alice Marie Gettig | Langeland Family Funeral Homes, Inc.
Alice Marie (Brown) Gettig, 68, passed away Friday afternoon, February 9, 2018. Alice was born November 12, 1949 to the late Troy and Violet (Feathers) Brown. Alice was united in marriage to Harley Gettig on April 20, 1968 at Fort Hood, Texas. Alice enjoyed spending time with her grandchildren, knitting and crocheting for her loved ones, and many other miscellaneous crafts. She loved to visit the beauty of the Upper Peninsula, visit the lighthouses, and try her luck at the casinos with her husband of nearly 50 years. Her peanut butter fudge was a big hit with everyone that tasted it and sold out at craft shows. She loved to dance and doo-wop in the garage to the oldies, enjoyed a good nap just about any time of day, and was always ready for a cup of KAHfee (coffee). With her smile and big heart, it didn't take long for Alice to become your friend. Whenever she heard of a need, she'd try to figure out how to meet it. Alice was the real deal; you could always count on her for anything. Alice is survived by her husband, Harley; her children, Anthony (Kathy) Gettig, Troy Gettig (Fiance Nancy White), and Joshua (Courtney) Gettig; fourteen grandchildren (Hannah, Ashleigh, Grace, Bethany, Ty, Luke, Violet, Faye, Randee, Troy Jr. "TJ", Hailey, Joshua (Bobo), Emily, Lillian (Lil)); four great grandchildren (Negi, Oliver, Izzy and Caleb); four sisters and two brothers (Carolyn, Nancy, Linda, Pamela, Bill, Mike); and numerous nieces and nephews. Alice was preceded in death by her parents and three brothers. The family will greet friends on Thursday, February 15th, from 12 - 2 p.m. at the Langeland Family Funeral Homes, Westside Chapel, 3296 S. 9th St., where a funeral service will begin at 2:00pm. Interment will be in Ft. Custer National Cemetery at a later date. Memorials may be directed to Eleanors Pantry in Paw Paw.